I took a bit of time the other day to hit up a local lake. When I first started thinking about heading out there, I hadn’t planned on doing serious fishing. Just a bit of shore fishing and maybe a stop or two on the drive to see what the creek that flows out of that lake was doing. When I woke up that day, though, it was beautiful. The sun was shining, for one. It hadn’t been shining much lately, so I took the hint from mother nature and threw my canoe on top of my car and made my way out to the lake. I’ve fished this lake quite a lot over the years. It’s the closest lake to where I live (that isn’t huge) and, because of how tricky it is to get a boat on the water, I’m often the only one on the water–the shore of this lake, on the other hand, is usually littered with people fishing. 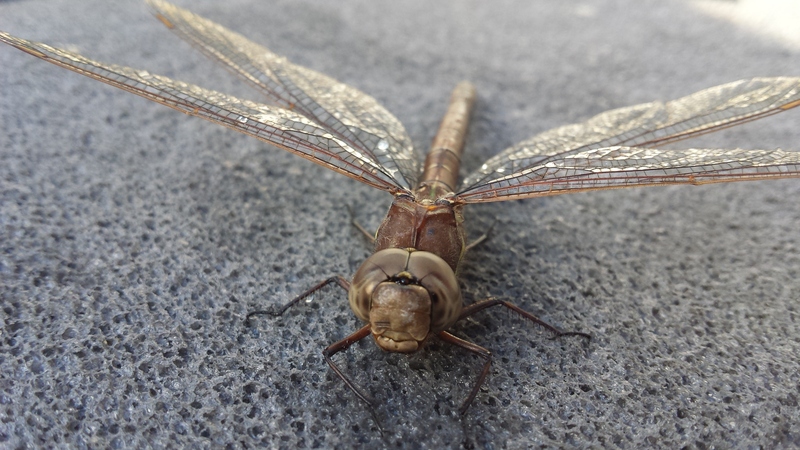 After hauling my canoe over the fence and carrying it down to the water, I took a few mental notes about what I was seeing–a handful of rises, no bugs beyond dragon flies and no shucks. Confident that I had the correct fly on my line I paddled out and started to search for fish. There wasn’t much going on at first. 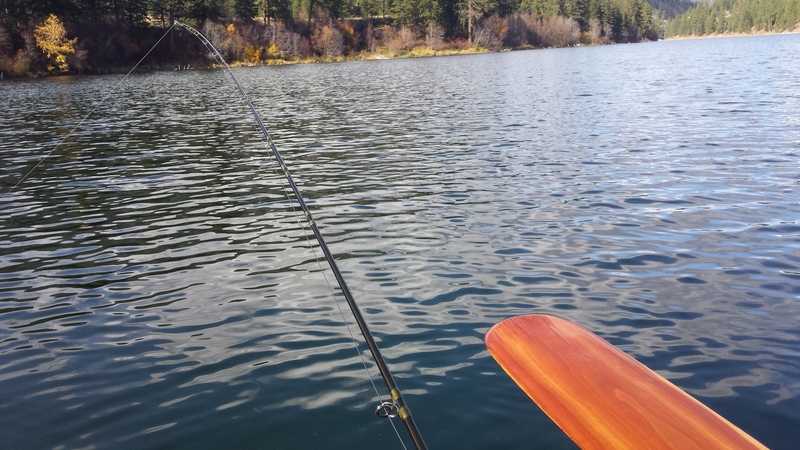 I paddled around trying to find fish, checking all the usual spots where I had had success on recent trips, but when they proved to be fish-free (or at least free of fish that were interested), I paddled out to a section of the lake I hadn’t fished in quite some time. As I had mentioned, I’d fished this lake quite a lot in the past and I had seen some pretty decent looking fishing following my lures around out in that spot in the past. I was hopeful that returning to that area with a fly would actually result in a fish or two. It’s a big lake, though, and I hadn’t been able to get out to that section since I started fishing it again with a boat. As I was moving, I noticed something strange on the hillside. It was white, which wasn’t that unusual, but what was unusual was just how white it was. It was almost like someone had stuck a large white statue up there, which would have been practically impossible given its location on the cliff. Or, at least I think it did. I realized immediately that it had to be a mountain goat (or my imagination was playing tricks on me in a big way). Mountain goats aren’t unheard of around here, but they’re not super common. There was a herd that lived a couple of ridges over closer to the highway, but I hadn’t ever seen one around here before. After fishing and goat watching for a while, I switched flies. I hadn’t had so much as a sniff since I’d hit the water, something that wasn’t super surprising for that lake, and I was hoping to change that. There’s a goat up there, I swear. I started getting hits almost immediately, although it would take me the better part of an hour to actually get a fish up to the surface–the water is around 50 feet deep here, I think–I had a blast playing around with what turned out to be brook trout. The remainder of my time on the water was spent happily playing with the brookies and watching the goat meander around the cliff. It wound up being exactly the day I needed. A two year old with back to back colds, both of which made their way into my system, meant that everyone had been spending a little too much time in the house lately. We weren’t sleeping well, we weren’t feeling good, we all needed some time to ourselves. Those few hours on the water managed to bring out a fairly relaxed mood that made all the difference in the world. A good day of fishing, even one where no fish are landed, has a tendency to do that. The really interesting thing about that day was the effect that changing flies had. For one, I kind of knew that I was switching the target species when I changed–I changed from a pattern that had done really well with the rainbow trout in that lake before to a pattern that was supposed to be good at tempting out the brook trout. I hadn’t expected to find myself surrounded by brookies, though. It was just lucky that it had happened. I would have expected to find the brook trout holding in the shallower parts of the lake near creek mouths and such, not holding in what I think was about 50 feet of water–I didn’t have my depth sounder that day and my reference map tells it’s about 45 feet. I love learning new things about the holding patterns of the fish. I’m sure, though, that the fish will all be in different spots next time I’m out there. It’s always the way it seems to go. It was such a great day that I’ll be heading out there again later this week with my wife, who hasn’t been out on that lake since our daughter was born. It should be a good day on the water for both of us (assuming the weather cooperates and we don’t end up with cold #3 to deal with). I just hope we can see that goat again. Fishing on that lake, in the presence of brook trout and wild mountain goats, sounds like the perfect therapy for bodies stressed out by the common cold and that common malaise called “humanity” (friends and family excluded, of course). Hope you have some more good luck with trout and goats this season. It really was just what I needed. I was actually surprised how much I managed to relax by the end of the day. I’m hoping the lake has the same effect on my wife tomorrow. What great therapy when there’s sickness around! This looks beautiful, thanks for showing what you use for the brookies.. I’m just getting into lake fishing and all the tips are super helpful! What a treat to see a mountain goat!! Where about a is this? Thanks for commenting! Lakes can be tricky. I’ve more or less only fished lakes and I still feel like I’m just guessing most of the time. 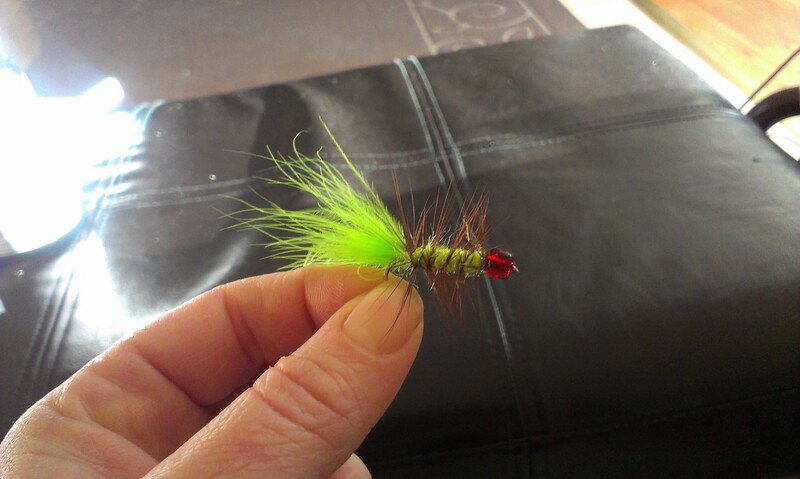 That fly is a chartreuse woolly bugger with some orange (I think) hackle. It’s a great fly for bass, walleye and, apparently, brook trout. I was also using a full sink line. 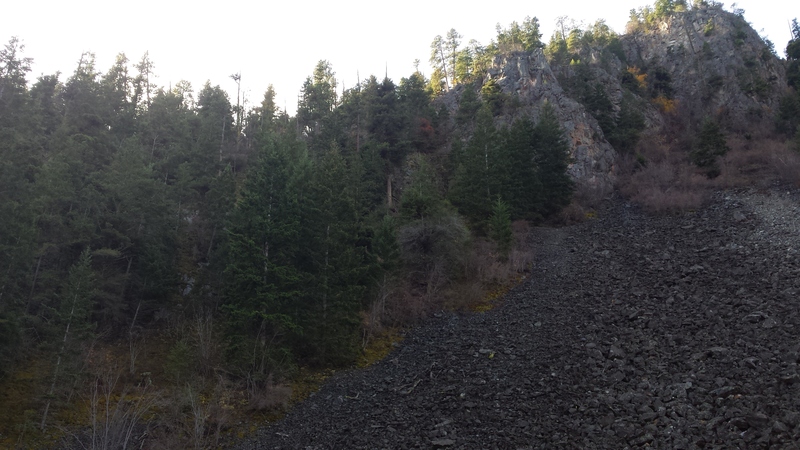 Type 7, I think.This is in the Southern Okanagan valley in BC. I had to write that down and take it into my old fishing guy at the store.. that was a whold different language to me! No luck yet.. but i’ll keep going! Keep writing! I love it!! Thanks, Molly! Depending on the kind of fishing you’re looking to do, online forums are really useful. If you’re local to BC check out Flybc.ca or fishingwithrod.com both are great. On Flybc you’ll also find a lot of organized events like fly tying nights and such. You can learn a lot at things like that. Feel free to drop me a line if you’ve got any specific questions. I’m always happy to help shorten the learning curve.